As a grammar fan and Korean learner, I was really excited when Song Won, the author of Korean Grammar for Speaking, contacted me regarding his newly released textbook series. The books are brand new – the first volume came out in 2016 (a revised version in 2018), and the second volume was only published in November 2018. Korean Grammar for Speaking is currently available in two volumes, volume 1 focusing on beginners and 2 geared more towards intermediate students. This book is good for beginners who have some grip of hangul already. Although there are 10 pages dedicated to learning hangul, I find that a hangul-specific textbook/website/resource may have a better approach to help people learn the alphabet faster. Once you have a grip on hangul, regardless of the resource you’ve used, it’s good to use this textbook to understand grammar going forward. I was surprised to see that the first unit in KGFS volume 1 is about numbers and how to read different types of numbers. Given the title of the series, I would have expected something conversational, like introducing yourself or speaking about hobbies. That being said, there are plenty of textbooks that do that already. For this reason, I think KGFS is good for someone who already has a basic grasp of greetings. Right after the sections that teach/review hangul, you’re presented with numbers and questions like translating “When is your birthday” or “What is your postal code”?. If you don’t know the word for birthday, for example, you might feel lost. Once you are past the first 10 units, you’ll reach sections that start appearing more conversational, with questions and answers as examples. Here are some example unit headings so you can see what you’ll learn. 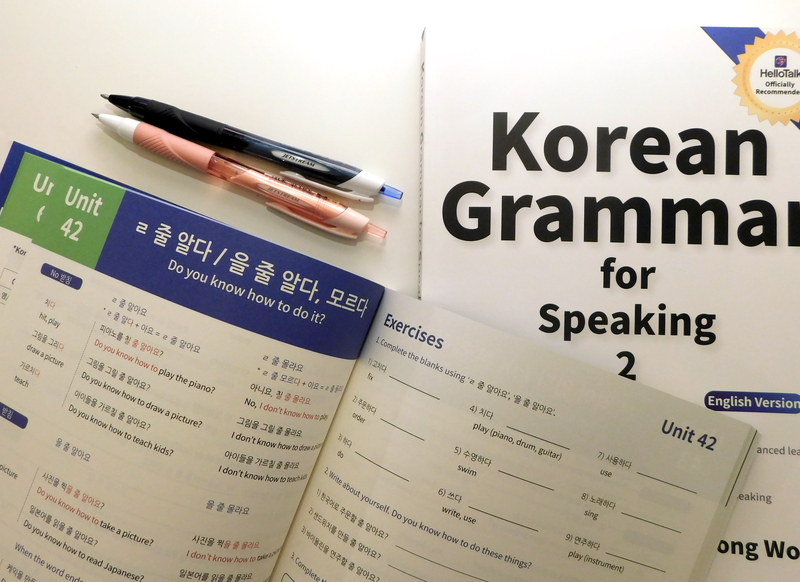 The textbooks focus on commonly used grammar structures to make your Korean more natural. It’s different from Korean Grammar in Use from a few aspects. Both KGIU and KGFS have units based on a single grammar structure, followed by example sentences and activities, but the layout of each textbook is slightly different. Let’s compare. Each unit teaches a single grammar structure with lots of example sentences on the left page and has exercises on the right page. There are no ramblings, culture notes or images, so if you’re keen to focus just on grammar, these books are great. That being said, if you’re looking for in-depth, advanced grammar explanations, this book may be too simple for you. There’s also his “language autobiography” in the second volume which makes for an interesting read. At the back of the book he also provides links to his social media and his email address to contact him. Though I don’t recommend spamming him with questions, having a “face” behind the book makes the book feel more human and friendly. Song Won’s Soundcloud has audio to accompany each lesson in the beginner volume. The audio for the second volume can be found here. Some of it is not very well-organized (inconsistent titling), but once you’ve found your way around, the audio files are good to follow with. Note that the audio files just read what’s on the page and don’t provide extras. On the other hand, his video lessons are much more in-depth and he’ll mention some example words and sentences that you won’t find in the books. Unlie audio, video lessons are for both the first and second volumes. As mentioned before, each section ends off with a series of exercises. There are answers at the back so you don’t need to worry about getting them checked. These books have thin soft covers and nice paper for writing on. I found KGIU to have glossy paper which smudged pen easily. KGIU is also heavier and thicker. The design is simple, fonts easy to read, and uses a handy color coding system (conjugation changes in red, extra notes in green, subheadings in blue etc). First few units in the 1st volume focus on hangul, telling the time, reading numbers and saying days of the week/months. This is good for general knowledge but not directly focused on “conversational” Korean. The “conversation” part only starts later. There are also no long-form conversations, and “conversations” are generally in the form of Q&As (e.g. “Have you ever met the president?” “No, I have not met the president”). Some exercises are just in the form of “Make a sentence using X grammar structure”. This may get boring for some learners. KGFS is best used alongside the audio and video lessons that Song Won has so professionally prepared and made available for free! That’s right, even if you don’t have the book and you’re reading this post, you can still check out his video lessons or his Soundcloud with audio! What I did for the second book was to do the lesson first by going through all the example sentences and writing down vocabulary I didn’t know. I like to learn words in context, so I made sure to write the accompanying sentence too, so I can remember how the word is used. I color coded my notes to have vocabulary words in one color, English translations in another color, and example sentences in a different color. This is optional and ultimately how you decide to take notes should not be forced, but a comfortable way that works for you! Unlike some textbooks that have phrases for you to memorise, these grammar-based books equip you to make your own sentences. This empowers you to start speaking because after the drills you’ll have a good grip on how the grammar works. Be sure to use the grammar structures you learnt so you can apply your knowledge and not let it get rusty! You can also take Song Won’s course on Udemy. There are e-books on iBooks for iPhone users too. Ebooks are also available on Amazon, and will be on Google books soon. This is not a paid blog post. I was sent the textbooks by Song Won free of charge, but promotion is done out of my own will to share content and tips with you, my readers. You’re probably here because you’re looking for motivation to continue studying a language. Maybe you’re burnt out or maybe the original passion you had for the language has died out. Whatever your reason, read on to find some tips on what to do when you really don’t feel up for studying. This is one of the most common reasons why people struggle to sit down and study a language. They are so scared of making mistakes and messing things up that they don’t even try. In this case, your anxiety takes over your motivation. Often times, our fear of failure stems from not seeing instant results. We look at people on YouTube or Instagram and see how fluent they are in the languages they’re learning, but we don’t see the time and effort they put into achieving the results. This brings me to the next point – you’re probably looking at the bigger picture and not taking language learning in bite-sized chunks. You’re thinking of the future too much. You wanted to be fluent, like, yesterday. Thinking ahead of how good it’ll feel to be fluent might be a good driver to study, but it won’t keep you going because that’s just mindless dreaming and not real action. You need a plan and goals to achieve your dreams – just thinking about them isn’t going to be enough. In our world of instant gratification and so-perceived overnight successes, it is becoming harder and harder to live and work with patience. You must understand that learning a language takes time and it requires a strong base and patience. Hold onto that. Language learning takes years, and nothing happens overnight. Studying 24/7 is not effective for anyone. In fact, it will make you tired and demotivated since your body needs rest and a break. Your brain cannot take in massive amounts of information at a small time. If that were the case, language learning wouldn’t be a journey or an exciting thing to add to one’s CV because everyone in the world would be able to learn any language in minutes. Reward yourself for every little step you’ve taken and how far you’ve come, no matter if you feel progress is slow. Having a reason to begin and a reason to continue is crucial in language learning. There will undoubtedly be times when you feel tired of the language, crying over grammar at night, or feeling frustrated with yourself because you lack vocabulary. Remembering why you chose this language in the beginning can give you some hope! It’s not good enough to say you want to be fluent. Think of a tangible, measurable reason. Do you want to work in Italy? Do you want to converse in Tamil with your boyfriend’s parents? Do you want to understand Anime without subtitles? All of these are valid, measurable reasons. You might be stuck since you’re only using one textbook, or only going to classes once a week, and not using the language outside of that. Try adding variety to your language learning! If you’re used to sitting and studying from a textbook, try phoning a friend in the language instead. You can also get a language tutor if you’ve never gotten lessons from anyone yet. I love using italki to meet tutors – there are so many tutors for different levels and needs. Even if I have a busy schedule, I’m bound to find someone whose schedule fits mine. Try out italki and get $10 free credits for your first lesson here! We underestimate how much our environment affects our productivity and mental state. I think some of the popularity with studyblr (photos of people’s study spaces and notes on Tumblr) stems from the fact that the spaces photographed are very charming, tidy and quirky. Though you don’t need to go out and buy a new desk or flowers, just giving your work space a quick clean-up and making sure you have all your materials with you is already a big start. Check out this video I made on motivation and language learning. Don’t be so hard on yourself, and pat yourself on the back for what you’ve done so far. Can you see progress from a year ago to now? If so, you’re on the right track and you’ve done an excellent job. Keep going! It’s okay to slow down. Just don’t stop. My friend Alex Rawlings said he once heard someone tell him that learning a language is like swimming in a river. If you stop swimming, you float back because of the current. If you keep swimming, no matter how slow, you’ll at the very least stay at the same place or move forward slowly. You can do it, and I believe in you! You might be the most extroverted person on the planet, but as soon as you start learning and speaking a new language, something in you changes and you feel a bit more shy. You’re nervous you’ll make a mistake in front of a native speaker. What if they laugh at me? you think. Fear when speaking a new language is very normal when starting out. It’s healthy and OK as it drives us to be conscious of correct grammar and vocabulary usage. I think it’s because we don’t want to be seen as inferior or stupid, and learning a language brings us down to a baby’s level again. It’s important to remember that babies and kids aren’t afraid of making mistakes – the more they mess up the faster they learn! You’re probably reading this because you’re looking for a practical way to get over the fear of making mistakes. Me telling you it’s OK to make mistakes is not going to help. What helps is to identify WHY you’re afraid of speaking a language. It could be because you’re too shy (same tbh) or because you don’t know enough vocabulary. It’s great advice to tell someone to start speaking a language from day one, but for some people, a combination of shyness and lack of vocabulary makes this nearly impossible. Remember to be kind to yourself – if you don’t feel ready, take some more time. If you use the wrong particle, grammar structure or word, what’s the worst that can happen? People will either correct you, ignore the mistake because they understood you anyway, or, in the least likely scenario, be a bit confused and ask you to repeat – which is a good opportunity to learn from the error. If people laugh at you, that’s a reflection of them as a person, not you. When I was working as a design intern at a Japanese company, I was VERY scared that I wouldn’t understand anything during meetings and presentations. It’s impossible to know what words to expect, but luckily I had an idea of what we would be talking about. It helped me a lot to look up words I suspected I might hear during the internship. I built vocabulary lists and example sentences of design-related vocabulary. In this way, I taught myself. You can’t find a textbook for every topic under the sun, so taking matters into your own hands and creating your own language learning materials boosts your confidence and helps you improve faster since you’re learning something that has direct value to your life. You may even want to write out a full conversation the way you imagine it going. I do this for job interviews in foreign languages a lot. I have taken many job interviews in Japanese and Korean, and to ease my nerves, I like to write out what I expect my interviewer to ask me, and how I’ll answer accordingly. It’s an effective way to learn new vocabulary too. In the case of online interviews, I pasted some vocabulary cards on my wall and laptop screen for quick reference. Obviously you can’t do that when you’re talking to someone in the flesh – but people will certainly understand if you pause for a while to try and look for the right word. If you cannot remember or don’t know a word, you can always talk around the word and describe it in another way. If you don’t know the word for “cake” for example, but you know the words “sweet” and “food”, you can say “sweet food” and they might say “cake?” in return. Just like practicing a speech for a presentation, you can practice using new words and phrases in a safe environment until you’re ready to use it with a native speaker. This could be talking to yourself, a pet, a chatting partner online, or a tutor. My favorite method is talking to people on voice apps. When I can’t see someone’s face and they can’t see mine, I feel less ashamed of making mistakes. For practicing Mandarin, Japanese and Korean, I use an app called Goodnight. It’s not really for language exchange per se, but it’s a great way to be connected to people around the world via a phone call. Since it’s just a voice chat, you don’t even need to know what the person looks like, and you can practice talking to them in your target language. The worst that can happen is one of two things: 1. They’re a creep 2. They hang up. No biggie, right? In the former case, just cancel the call and move on. If they hang up on you – no worries – you can just dial to connect to the next person. It’s a very effective way to improve your pronunciation too since you’ll be hearing your target language so much! Other apps you can look into are Saito San, Kakao Talk and Wakie (click those links to see me practice Japanese and Korean on apps!) You can try Omegle too but it’s full of creepy people. Lastly, remember not to take language learning too seriously. Your goal is to communicate with others, right? It’s counter-effective to worry about using the right words and grammar each time you try to say something. Rather be natural and throw in a bunch of words hoping it makes sense, instead of staying quiet and missing the point of communication. Your listener will more often than not help you in the right direction. Women In Language 2019 is coming! Women In Language is a three-day, online seminar featuring some of the most influential women in the online language-learning community. From 7 to 10 March, more than 30 female speakers will be sharing their thoughts on language learning and culture. If you haven’t already, make sure to register here for Women In Language! There will also be raffles and exciting events where you can interact with speakers during their calls. And it’s all digital, so you don’t even need to leave your couch. Speakers will be presenting on the following topics, as stated on the Women In Language website. I have the honor of speaking alongside some of my favorite polyglots, like Ophelia Vert, Abigail Lang, Language Bae and more! My talk is titled Identity Crisis: The ups and downs of living, working and dating in a foreign language. Register for Women In Language here! Tickets are $29, meaning its only $1 per speaker – you can attend all the talks on all the days if you register! Proceeds also go to Wikitongues – a nonprofit that I was a co-founder for a few years ago. What if I’m busy between 7th and 10th Mach and can’t attend all the talks? No problem! You will have lifetime access to all the talks after the event so can catch up as and when suits you. Also, you will have free access to the Women In Language Facebook Group that will be a place you can ask questions to Kerstin, Shannon, Lindsay, and even some of the speakers at the event. So you won’t be left behind! Why did I move to Singapore? I fell in love with Singapore in 2015. When I was in university, I discovered The Sam Willows online. They’re a Singaporean band and I really enjoyed their music. That led me to discovering more Singaporean music, like LEW, Disco Hue, Jasmine Sokko, Sezairi, Charlie Lim and M1LDL1FE. A lot of you know music is often my reason for learning a new language or for falling in love with a new culture. (Here’s my Singaporean playlist on Spotify, by the way) After YouTubing around, I also discovered Singlish (Singaporean English, which is mixed with lots of Malay, Tamil, Chinese, Hakka, Cantonese and Hokkien words). I thought it was the coolest concept ever. So multilingual and so versatile and expressive! I also started watching local Singaporean YouTubers and found the humor seriously hilarious. The more I watched Singaporean stuff, the more I fell in love with the language, accent and country. After months of listening to a lot of Singaporean music and checking out the Singaporean design scene (online), I wanted to visit and see what the country would be like. At the start of my fourth year of university, I started casually looking for jobs and decided to visit some design agencies in Singapore on my way back from Japan in January 2016. I contacted some design agencies and arranged to visit their studios. My mom came with me and we had a short 5-day holiday. To be brutally honest, it was not what I expected at all! The internet (and now, Crazy Rich Asians), makes Singapore seem like the most modern, clean, atas (Singlish for “posh”) city ever. In some areas, this is true. Marina Bay Sands is really as fancy as it seems online. However, overall, I found that Japan was a lot cleaner than Singapore! Some parts of Singapore reminded me of Pakistan too. I love hawker centers now (half-outdoor food courts with lots of different eateries, generally small stalls run by old people specializing in a specific dish or two), but the first time I saw a hawker center, I was put off by the smell of durian and fish. That being said, having lived in Pakistan for 3 and a half years, nothing scares me anymore! I think it was more of a “this is not what I expected” moment rather than it being a “this is gross” moment. I can’t get enough of hawker centers now! My heart got broken in 2018. That initial surprise, coupled with the humidity and constant rain at the time, somewhat put me off Singapore for a while. Until I met my (now-ex) boyfriend. He was Singaporean and before he became a terribly controlling, emotionally abusive person, I was absolutely swept off my feet by him. His Singaporean accent was the cutest thing ever, and I started having rosy feelings towards Singapore again. But then after I broke up with him, I didn’t want anything to do with Singapore anymore. I didn’t even want to hear the word Singapore, and I didn’t want to hear Singlish either! At the end of 2018, everything changed. GOD IS GOOD AND HE RESTORES! After prayer, therapy and serious logical thinking, I eventually got over my ex and started moving on with my life. Part of that process was also to move to a new country. I started applying for jobs in many different countries. Japan and Korea was where I set my eyes upon, but I also casually browsed job postings in Singapore. Not having much hope (most job posts said “Singaporeans or Permanent Residents only”), I still took the plunge and applied for jobs in Singapore too. 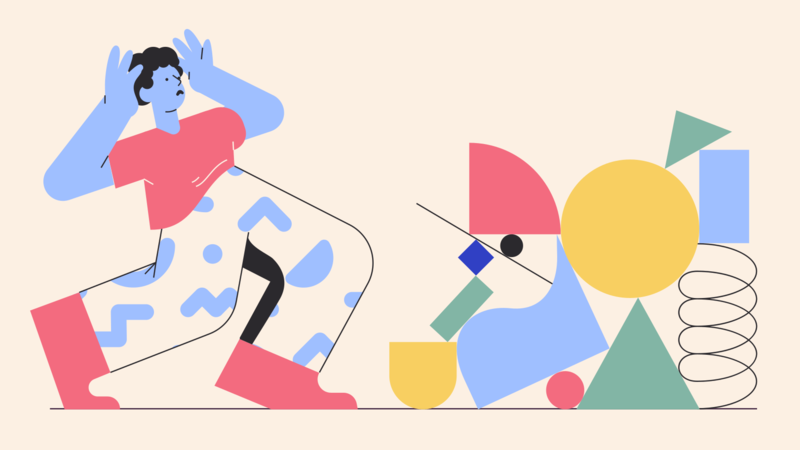 I was pleasantly surprised to land a Skype interview with a design consulting agency. The interview went exceptionally well. I’ve had my fair share of interviews, and some of them have been downright BAD. (Ripped pants? Been there. Forgetting the boss’s name? Yep. Stumbling over my bad Japanese? Lots of times). This time, we really clicked and had a great conversation, and then a second interview was scheduled. At the end of the second interview, I was told that I got the job. Trying to keep my composure on the Skype call, I thanked them and said I would get back to them in a few days with my final decision (lol, like I even needed time to think). All the doors just started opening. I believe in the power of prayer, and how I know my prayers are being answered is not only the peace in my heart about something (if it feels bad it probably is bad, if it feels right it probably is right), but confirmation. Confirmation means people start agreeing with what you say, or people bring it up out of nowhere. I started getting very excited about the idea of living in Singapore and my love for Singapore came back! It’s been a month since I moved here, and I cannot remember the last time in my life that I’ve been so incredibly happy. Every morning I wake up with wonder and gratitude that I’m living here. The people are friendly, the food is good, and the year-round summer is a dream for someone like me who hates winter. More posts are coming soon about the logistics of my move, like how I got an apartment and what interesting cultural shocks I’ve experienced, so stay tuned!